With Facebook’s Oculus Rift set for a consumer launch later this year, big name film directors are already working on new virtual reality content, according to news reports. Directors including Stephen Spielberg, Jerry Zucker and Ridley Scott are reportedly involved in creating VR content. Analysts told the Wall Street Journal this week to expect new apps later this year with improved VR. Users can take in the simulated sights and sounds of, say, Mount Everest, or visit outer space, by downloading the specialized software to a phone tethered to a pair of goggles and headphones. “You can now do mediocre stories, but because of virtual reality they’re amazing,” Zucker joked to the Journal. The jounal reprted that these directors are all working on projects using Virtual Reality Co., a Los Angeles-based firm started by four Hollywood veterans, is at work on a program that enables users to investigate futuristic crimes in 10- and 15-minute chapters, as well as a documentary experience that lets them ride along with former Pittsburgh Steelers great Jerome Bettis as he prepares for his Hall of Fame induction ceremony. They are not the first directors to move into the VR space. 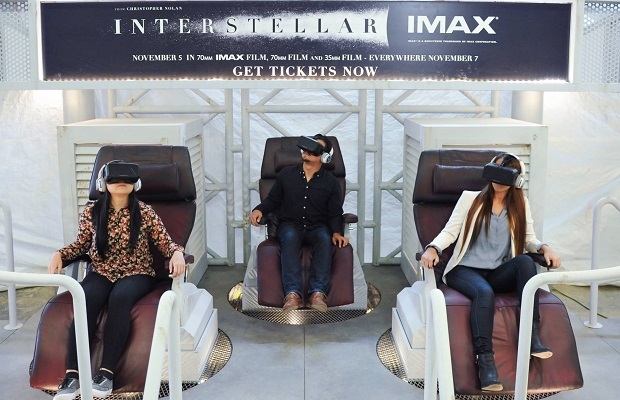 Late last year, Interstellar ’director Christopher Nolan let fans in four US cities – New York City, Houston, Los Angeles and Chantilly, VA – watch sequences from the film through Oculus Rift virtual reality headsets. Recently another virtual reality company Magic Leap, released a video of its product which shows it converting a real office into a sci-fi environment populated by aliens. The company , which has raised hundreds of millions of dollars to finance its work, gave a glimpse at what it is working on with a short YouTube video. The video showed a “game we’re playing around the office right now”, according to the video’s description. It is the first video uploaded to the company’s YouTube channel, and the first proper glimpse at what the company could be working on.